Did you know that around 50 billion bottles of mineral water were consumed annually in the United States (and 200 billion bottles around the world)? That makes it the second most often consumed beverage after (unfortunately) soda water. Are you one of those who are convinced that bottled water is better than tap water? Then you should read on. Beyond the fancy labels of bottled water and the sweet terminology used to market bottled waters, they’re not necessarily pure. The Natural Resources Defense Council found that among 1000 bottled water they tested, 22 brands contained chemical contaminants above the state health limit. So even when the bottled water label states that it’s “Natural” or “Pure”, it isn’t always necessarily so. A study held in 2010 actually proves that there is only little difference in taste between bottled water and tap water. The test participants were given six different bottled waters and six types of tap water. The result showed that the participants preferred medium mineralization; characterized by its tasteless and cooler factors. In this case, tap water and bottled water have very little difference in taste. About 25 per cent of bottled waters come from tap water which is purified and given some added minerals. A couple of examples include Dasani and Aquafina. 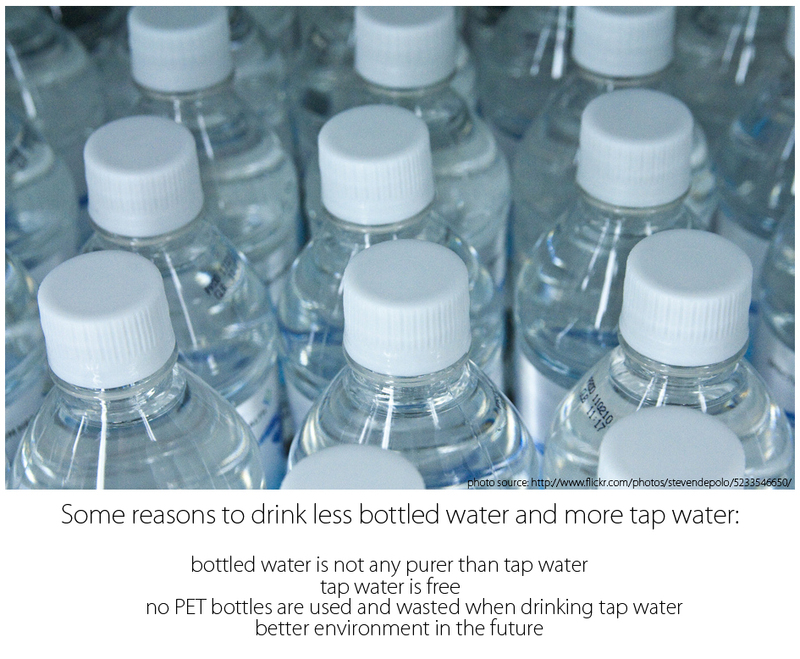 By drinking tap water, we eliminate the chance of adding more PET bottles in the landfills. About 90% of the consumed PET bottles from bottled water end up in the landfills, instead of being reused or recycled. These bottles could spend at least 400 years until they are finally decomposed! Drinking less bottled water lessens the chance of the landfills getting more and more plastic that is hard to decay. If we reduce the bottled water consumption, we automatically reduce the production of the plastic bottles. That means less crude oil used to make them. Do you drink more bottled water than tap water? After reading this article, hopefully you’ll drink more tap water and less bottled water. And even if you do have to drink from bottled water, reusing the empty plastic bottles creatively gives a second life to the bottles. Let’s help save the environment!